FRISCO, Texas (Sept. 6, 2017) – The Frisco RoughRiders Foundation raised $30,856 for Hurricane Harvey relief throughout the team’s final homestand of the regular season, which ended Sept. 4. The proceeds will be donated to the American Red Cross. Riders Outpost also has limited edition “Texas Tough” T-Shirts available both in store and online for a minimum $10 donation to the American Red Cross’ Hurricane Harvey relief efforts. More than 1,000 t-shirts have been ordered and will continue to be available at roughriders.milbstore.com through Friday, Sept. 8. The Frisco RoughRiders are the Double-A affiliate of the Texas Rangers and play their games at beautiful Dr Pepper Ballpark in Frisco, Texas. The team was founded in 2003 and has finished first among all Double-A franchises in attendance in each of the last 12 seasons (2005-2016). In August 2014, the RoughRiders were purchased by an ownership group led by Chuck Greenberg. The new ownership group, together with the city of Frisco, has spearheaded numerous major franchise improvements over the past two seasons, investing nearly $8 million in a wide array of facility upgrades and improvements, including a new state-of-the-art HD video board, sound system, Bull Moose Saloon, InTouch Grille, Riders Outpost Team Store and the newest and biggest creation, the 174-foot Choctaw Lazy River. The upgrades made prior to the 2015 season earned the Riders and the City of Frisco “Best Ballpark Renovation” of 2015 by Ballpark Digest. The same publication also honored the Choctaw Lazy River as the best ballpark improvement over $1 million for the 2016 season. More than 140 former RoughRiders players have gone on to play Major League Baseball, including All-Stars Chris Davis, Adrian Gonzalez, Ian Kinsler and Nelson Cruz, as well as current Rangers stars Elvis Andrus, Rougned Odor and Nomar Mazara. 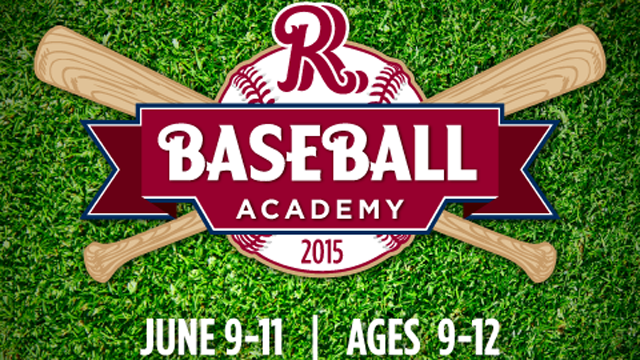 For more information on the Frisco RoughRiders and Dr Pepper Ballpark, please visit RidersBaseball.com or contact Art Garcia at AGarcia@RidersBaseball.com or Ryan Rouillard at RRouillard@RidersBaseball.com. 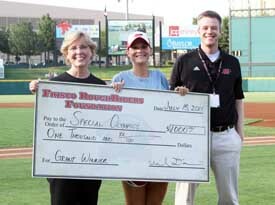 For the ninth straight year, the Frisco RoughRiders Foundation distributed tickets and t-shirts to charities in North Texas for the Kids’ Night Out Program. This special program is funded by Whataburger, the RoughRiders Foundation and RoughRiders season ticket holders, sponsors and suite holders. Over 3,000 tickets were distributed to underserved children and families in North Texas for the Sunday August 7th and Sunday, August 14th RoughRiders games. Each guest received complimentary tickets, parking, posters and t-shirts. 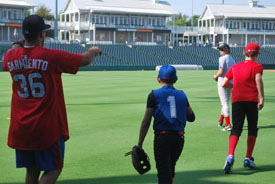 After the game, all children had the opportunity to go on the field and run the bases at Dr Pepper Ballpark. Over 50 non-profit organizations, and the people they serve, came out to enjoy the games. “We would like to thank the RoughRiders for allowing our agency to participate; they have truly made a difference in the lives of our children and families,” Stacey Jourdain, from the Department of Family and Protective Services said. Big Brothers Big Sisters North Texas, The Children’s Advocacy Center of Collin County and the Ronald McDonald House were also among the 50+ non-profit groups to attend the Kids’ Night Out presented by Whataburger games. Kids’ Night Out guests enjoy the game while checking out their new posters. 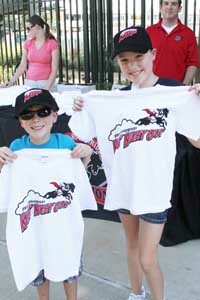 A couple guest during the Kids’ Night Out game on August 7th showcase their new t-shirts. 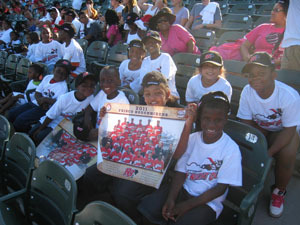 The Frisco RoughRiders teamed up with Whataburger to host Food Bank Night at Dr Pepper Ballpark on Saturday, July 23, 2011. Fans that donated two or more items received a free Whataburger voucher. The RoughRiders started collecting food on June 30th at Dr Pepper Ballpark all the way through the Food Bank night during the July 23rd game against the Corpus Christi Hooks. Over 750 pounds of food items were collected and then delivered to the Frisco Family Services food pantry, Little Elm Food Bank and the North Texas Food Bank. 2011 is the first year the RoughRiders have teamed up with Whataburger to organize a food drive. 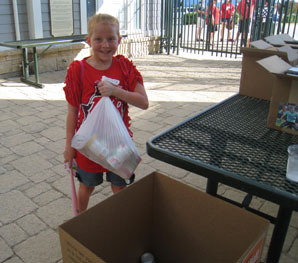 A ‘Riders fan deposits a bag of food items in the collection bins at the gates of Dr Pepper Ballpark on July 23rd. RoughRiders fans are all smiles as they donate food to support Food Bank Night presented by Whataburger. 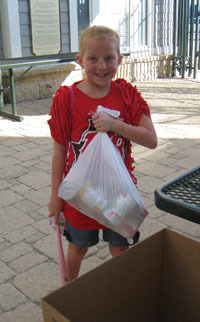 A 'Riders fan deposits a bag of food items in the collection bins at the gates of Dr Pepper Ballpark on July 23rd. The Frisco RoughRiders Foundation teamed up with the Taylor Hooton Foundation to host the the 3rd Annual Hoot’s Chalk Talk on Saturday, July 16th, at Dr Pepper Ballpark. 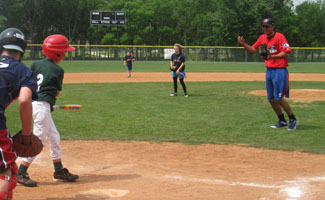 The free clinic was open to youth baseball and softball players between the ages of 12-15. Donald Hooton, director of development for the Taylor Hooton Foundation, spoke to over 150 youth baseball and softball players, and their families, about the dangers of steroids. 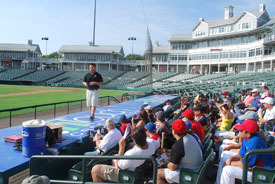 After Donald’s speech, Frisco RoughRiders team trainer, Carlos Olivas, and strength and conditioning coach, Eric McMahon, spoke to the group about the smart and safe way to train for athletic competition. The second half of the event was an on-field clinic where Mr. Olivas and Mr. McMahon lead different training exercises, and RoughRiders players, Elio Sarmiento and Renny Osuna, executed baseball drills with all of the attendees. Donald Hooton speaks to Chalk Talk attendees about the dangers of steroids. RoughRiders catcher, Elio Sarmiento, organizes a fielding drill on the Dr Pepper Ballpark outfield grass. The Frisco RoughRiders teamed up with Ed Randall’s Bat for the Cure during the Saturday, June 11th game, to raise awareness about prostate cancer. To commemorate the event, RoughRiders players and coaches wore blue arm bands in front of the sell-out crowd at Dr Pepper Ballpark. 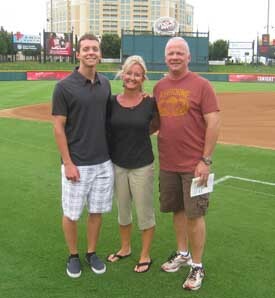 “It is a joy and privilege for this organization to work with the Frisco RoughRiders to help us spread our life-saving message of prostate cancer awareness,” Ed Randall, commented after the event. RoughRiders staff members wore blue bracelets during the game to promote the occasion and Ed Randall’s Bat for the Cure volunteers set up a booth along the concourse to educate fans about prostate cancer. Fans that visited their booth also had the opportunity to enter to win a RoughRiders blue bat signed by the entire 2011 team. 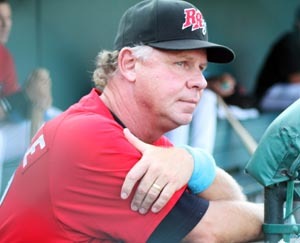 RoughRiders manager, Steve Buechele, wears his blue wristband in the dugout to help promote prostate cancer awareness. 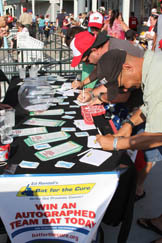 Fans fill out forms to recive more information about prostate cancer and enter a raffle to win a team signed bat. The RoughRiders Foundation hosted the third annual ‘Riders Classic presented by Tye Williams Financial Services, Smashburger and DC Rightside, LLC on Tuesday, June 7th, 2011 at The Golf Club at Frisco Lakes in Frisco, TX. 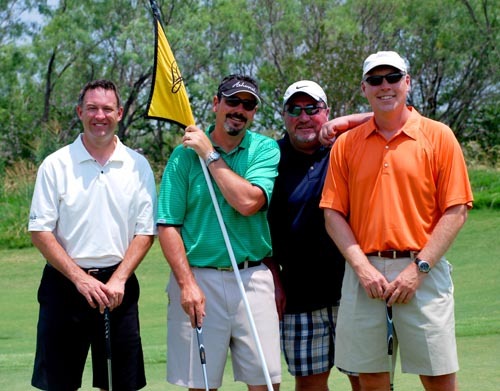 The golf tournament raised over $23,000 for the RoughRiders Foundation through sponsorships, registrations, a silent auction and raffle and mulligan sales. Boxed lunches were donated by Chick-fil-A at Preston Road and Highway 121, and dinner was donated and catered by Chuy’s on the Tollway. 27 foursomes competed in the ‘Riders Classic; 12 of which included RoughRiders pitchers Justin Miller, Richard Bleier, Jake Brigham, Ben Snyder, Corey Young, and Tyler Tufts. Other RoughRiders who participated were infielders Davis Stoneburner and Tom Mendonca, as well as pitching coach, Jeff Andrews. 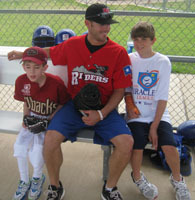 In 2011, the RoughRiders Foundation has partnered with Frisco Family Services, the Children’s Advocacy Center of Collin County and the Miracle League of Frisco. The money raised from the 2011 ‘Riders Classic will help fund these partners as well as the RoughRiders Foundation’s scholarship and grant donation programs. The Frisco RoughRiders Foundation hosted their 3rd Annual ‘Riders Bowl tournament on Wednesday, April 21st at Main Event in Frisco, TX. 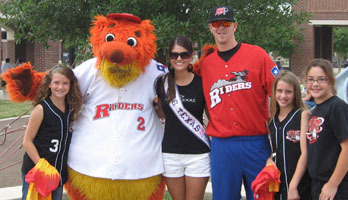 The entire 2010 RoughRiders Team participated in the event and all funds raised went to the Frisco RoughRiders Foundation. The event raised over $6,000 for the RoughRiders foundation through registrations and silent auction/raffle ticket sales. Over 100 people participated in the event and 19 out of 20 lanes were sold. First place was claimed by the team headed by ‘Riders pitchers Zach Phillips and Ryan Falcon. Second place went to the team that included infielder Marcus Lemon and the third place team included catcher Kevin Richardson. 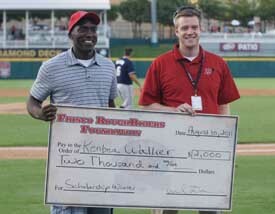 All proceeds from the event benefited the RoughRiders Foundation. The RoughRiders Foundation’s mission is to help families in North Texas through programs and events. In 2010 the Foundation has partnered with Frisco Family Services, The Children’s Advocacy Center of Collin County, Gilda’s Club North Texas and The Frisco Miracle League. 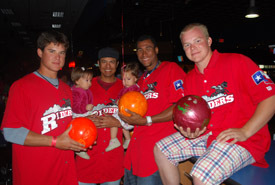 Frisco RoughRiders Players before the bowling tournament. 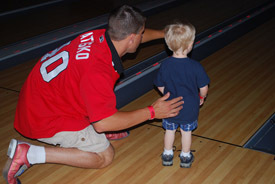 RoughRiders' Pitcher, Ryan Tatusko giving a bowling lesson to one young fan.